3/4 side rails with an innovative ergonomic mechanism, and the option of a protector at the foot of the bed. Most clients residing in long-term care departments are elderly, with differing degrees of immobility. The Eleganza 1 bed has electric positioning and a stand up handle making mobilization easier. Elderly people have specific needs with comfort and space contributing to an increased sense of wellbeing. 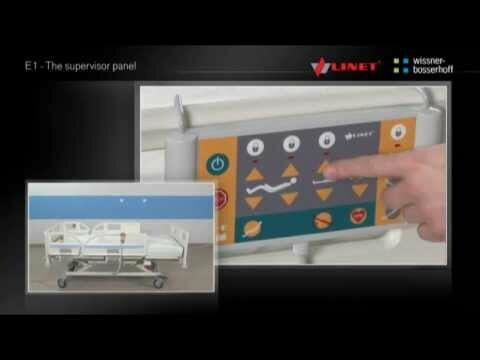 The unique Ergoframe design of the mattress platform improves comfort and reduces the risk of pressure ulcers. The Eleganza 1 bed has full electrical positioning and brings the quality and range of functions intended for acute healthcare into the area of longterm care adapting them for different care units. The main advantages of the Eleganza 1 include an aesthetically pleasing design, a high degree of safety parameters and support for convalescence. The Cardiac Chair position can be adjusted using a single button to maximize respiratory function and cardiac output. For a higher level of patient protection, the nurse can equip the bed with an independant protector and extension. The protector will lock the side rail in the 'up' position automatically. This handle serves as a fixed and stable support for the client when standing up from the bed. The handle makes the work of the healthcare staff easier and will actively support the client increasing their independence. Bed extension up to 15 cm. To maintain comfort for all patients, the standard width of the mattress platform is 90 cm and allows for a 15 cm length extension.